Sheriff Wayne Hannah has worked at the Fayette County Sheriff’s Office his entire adult life. He began his career with the Sheriff’s Office in October, 1974 as a communications officer (dispatcher) for then Sheriff James Jones. He worked every imaginable shift between that date and May 1976, when he was sworn in as a Deputy Sheriff and began to patrol Fayette County. He graduated from the Clayton County Police Department’s Police Academy in June, 1977. On January 1, 1977, Sheriff Hannah was sworn in as a Deputy Sheriff again by his predecessor Sheriff Randall Johnson. When Sheriff Johnson took office, then Deputy Sheriff Hannah was one of 14 members of the Fayette County Sheriff’s Office. Today, Sheriff Hannah continues his lengthy service in Fayette County, a tenure eclipsed by only one other member of the Sheriff’s Office—Lieutenant Francis Cavender. Sheriff Hannah was promoted to Corporal in February, 1979 in the Uniform Patrol Division and assumed responsibility for the supervision of all of the department’s dispatchers. He continued to supervise the department’s dispatchers until 1996 when that function of the department was transferred to the newly created Consolidated E-911 Communications Department. Sheriff Hannah continued to move up the ranks of the Fayette County Sheriff’s Office’s Uniform Patrol Division. He was promoted to Sergeant in 1981, then to Lieutenant in 1982. In December, 1983, he was promoted to Captain and made commander of the Uniform Patrol Division. In 1988, the Fayette County Sheriff’s Office was re-organized into five divisions and Captain Hannah was appointed as Director of the newly created Traffic Enforcement and Training Division. In March, 1993, Captain Hannah was promoted to the rank of Major. In March of 2003 Major Hannah was promoted to Lt. Colonel and continued to command the Traffic Enforcement Division until assuming office as Sheriff of Fayette County on January 1, 2009. 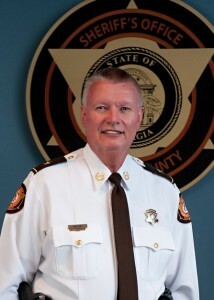 Sheriff Hannah continues to serve on various boards and committees representing Fayette County Sheriff’s Office around the County and the State. He currently serves on the Fayette County 911 Advisory Board, the Fayette County Board of Education Law Enforcement/Educators Committee, and the Metro Atlanta Traffic Enforcement Network. Sheriff Hannah is a member of the National Sheriff's Association, the Georgia Sheriff's Association, the FBI Law Enforcement Executive Development Association, and the Fayette County Chamber of Commerce. In September, 2011, Sheriff Hannah completed the 101st session of the National Sheriffs' Institute (NSI) held in Longmont, Colorado. The NSI is the only national executive development program designed for sheriffs. This program is co-sponsored by the National Institute of Corrections and the National Sheriff's Association. Sheriff Hannah is the first sheriff of Fayette County to graduate from the NSI. Sheriff Hannah has lived in Fayette County most of his life. He moved to Fayette County with his parents, Charlotte and Clarence, in 1969 and attended the 8th grade at the renovated school building in Tyrone. He then attended Fayette County High School where he graduated in 1974. Wayne has a grown daughter from a previous marriage and has two grandchildren, Hannah and Kendall. Wayne and his wife Deborah live in the eastern part of Fayette County. They are both members of McDonough Road Baptist Church. Our Community "Peace Forum" will begin with an overview of the Fayette County Sheriff's Office by Sheriff Wayne Hannah. President Richard Buchanan and the members of the Rotary Club of Fayetteville give heartfelt thanks to the Fayetteville clergy that will help with our round-table discussion regarding peace in our community. Our forum will be lead by Jack Smith and Sheriff Wayne Hannah. John Rezek, Editor in Chief of the Rotarian Magazine interviewed Rotary International President Sakuji Tanaka in February 2012 and below is an excerpt from that interview. His remarks will help us focus on his challenge to conduct a community peace forum. Remember one small effort can return incredible results. That's the power of Rotary. The Rotarian: Can you describe the process of coming up with the theme for your year, Peace Through Service? Sakuji Tanaka: The Rotary Peace Centers were established as part of The Rotary Foundation in 2002, and I was involved in setting up that program from the beginning, four years earlier. So I’ve had a strong association with the word peace, which I think is a very important thing to promote in the world. The Rotarian: Peace is often described by what it is not – for example, the absence of conflict. How do you define peace? Sakuji Tanaka: Peace, in my mind, is very abstract. It’s difficult to define peace. The definition probably depends on where one lives – the region or even the community. In some areas, having water to drink can lead to peace, or literacy can lead to peace. Just the idea of a family being safe can give a sense of peace. The concept of peace includes being satisfied, being content, being happy. So peace is very much a matter of individual perception. When I reflect, postwar Japan was very, very poor, and life was very hard, but some were satisfied simply with the feeling that they had returned to a more normal life. Currently, particularly in Japan, although there is no war, no conflicts, people are rather unsatisfied. Every community should be able to provide its youngsters with the possibility of having dreams. When I travel around the world, or around Japan, one of the first questions I ask young people is, what is your dream? Not everyone can come up with an answer. I would hope that everybody would have some kind of dream for the future – to become a teacher or president. The Rotarian: What must each of us be willing to do to promote and achieve peace? Sakuji Tanaka: I believe we all must think about why we are born into this world. Each individual has his or her own mission. During my year, I would encourage every Rotary club to have at least one meeting to discuss what peace means to the members. If people become more aware of what peace means to one other, each individual in the club will work harder to achieve it. I think each Rotary club must work to identify the needs of its community and then work hard on meeting those needs. The strength of Rotary comes from having 34,000 communities. If 34,000 clubs are working hard locally for peace, working together will bring us closer to the goal of achieving world peace. The Rotarian: Do you believe it is a strength of Rotary that we have no political, economic, or ideological tenets? Sakuji Tanaka: Yes, definitely. Although Rotarians represent different religions and ethnicities, we do not put an emphasis on our differences. I think it is a strength that we respect and tolerate diverse backgrounds and thinking. The Rotarian: In terms of achieving peace, are there some situations that are simply hopeless – failed states in Africa, for example, or the Palestinian-Israeli conflict? Sakuji Tanaka: There are situations that may indeed be hopeless, but we still have to work hard to find ways to help, such as supporting the United Nations in its efforts. The sad thing is that the people in those kinds of situations are not able to have the simple things in their daily lives that most take for granted. In poor countries, many people are not educated, and they cannot find a way to resolve the situation they are in. That’s why it is so important for Rotary to help in any way possible – to provide a literacy or educational program so people in need can earn their own living. You try to teach people how to fish rather than give them the fish. The Rotarian: Would it be helpful if UN personnel who carry weapons in conflict situations were not called peacekeepers? Sakuji Tanaka: Ideally, it would be better if they didn’t carry weapons, but they have to be able to protect themselves. The Rotarian: If peace breaks out, how will we know? Sakuji Tanaka: I think this goes back to different regions having different definitions of peace. In areas where people cannot go to work without fear, if they could be relieved of that fear, that could be peace. In areas where children cannot go to school without being threatened, if they could be free of that threat, that will be peace. For some people, reading a newspaper is impossible, because they are not literate. If one day they are able to read a newspaper, that may be peace as well. If every individual can achieve a feeling of personal satisfaction, that will be the ultimate peace. Even if a person is very wealthy, if that person does not have a sense of self-fulfillment or self-contentment, there is no peace for that person.